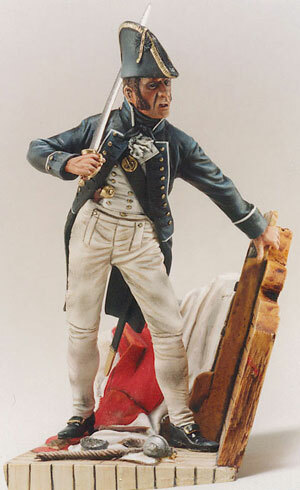 This model shows an officer in an action pose, perhaps preparing to repel boarders. His uniform carries the grime to be expected in battle and his face shows the determination vital to winning a hand to hand fight. On the deck appears the flotsam of rigging damaged by gunfire and it must have been easy to lose one's footing, with fatal effect, on a cluttered deck.